In a recent blog post I included some photos and video showing how primary school age children get to school by bike in a modern suburb of Assen. We take people to this location on the Study Tours because it's so obvious that the majority travel in this way. Children have great freedom, they smile, they socialize and and they're safe. We also visit other schools on the tour so that participants can see for themselves that it's not just the one school, but every school. However, none of this happened by accident. Plans from 2006 show how this suburb was intended from the very start to support children being able to ride their bikes and use them to go to school. It was expected that for every 100 residents there would be 86 cycle trips per day. However, primary school age children are not included in this total. They were considered separately and it was expected that they would make 2/3rds of all their school trips by bike. 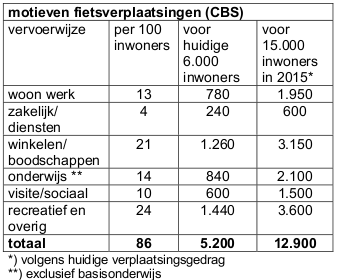 At the time when there were 6000 residents in Kloosterveen, primary school children added 1800 cycle trips per day to the total of 5200 made for other reasons (top to bottom, commuting, business, shopping, education (secondary or higher), visiting, recreational and other). Every country could have this. Every child could have it. However, it's only possible if the environment is transformed to make children safe and comfortable. Contrast with the way planning takes place in the UK, seemingly with politicians making brave statements about cycling while they actually intend for no children to go to school on bikes.